Rubik's Magic: Super Magic, "Magic Balls"
In Poland a 2×8 tile version of Rubik's Magic was made by ST Toys. It is called the "Magic Balls". Its tiles are actually only about 3/4 the size of Rubik's original tiles, so that the length of the puzzle is about the same as of the Master Edition. 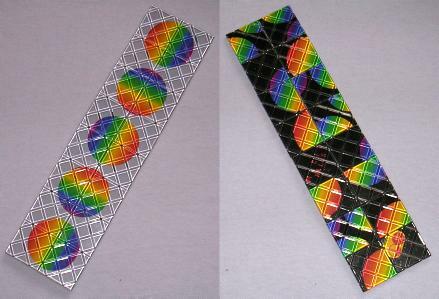 The design shows 5 multi-coloured balls, with a silver background on the front, and a black background on the other side. When the black side is solved, it is in a W-shape. In the starting position, do the star shift transform, shifting one tile along. in any direction. Do the rectangle transform. Note that just like this transform on the Master Edition needs one more step compared to that of the normal Magic, the super magic needs three steps until the rectangle shape is recovered. If necessary, turn over the puzzle to show the black side, the side you are trying to solve. Note the positions of the two tiles that have writing on them. Do the loop shift transform, making a loop and opening it at such a position that the two tiles are on the same side of the rectangle, with the "Produced by ST Toys" lying one tile away from a corner, and the "Magic Balls" tile lying two tiles away from another corner. You will see that there are 6 tiles that are already correct. 1. Hold the puzzle with the writing tiles in the top row of the rectangle. Number the tiles clockwise from 1 to 16 as usual (so the "Magic Balls" tile is number 6). 2. Fold the right 6 tiles (6-11) upwards on top of tiles 3-5, 12-14. 3. Fold the 2×2 square of tiles 7-10 back to the right again, on top or 6 and 11. 4. Fold 11-12 downwards to the left behind tile 13. 5. Fold 6-8 upwards down onto 9 and 10. 6. Fold 9-11 downwards up behind 4 and 5. 7. Fold 5, 6 upwards to the left on top of 4 and 13. 8. Fold 11-12 downwards to the right behind 7 and 10. 9. Fold 5-10 upwards up to make a zigzag shape. Now perform the six-flip shape changing transform on the long end of the shape (tiles 1, 15 and 16) to turn the puzzle into a W shape.